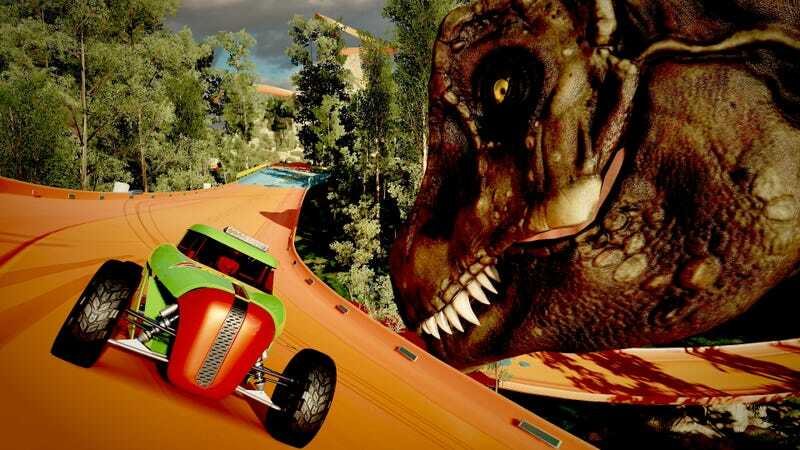 Miles of bright orange track winding through the sky, speed boost pads flanked by gigantic toy engines, loop-de-loops and dinosaurs—I can’t stop smiling when I’m speeding through Forza Horizon 3's Hot Wheels expansion. Released yesterday alongside a substantial PC performance update for Forza Horizon 3, the Hot Wheels expansion is everything I wanted and more. If a series of islands connected by Hot Wheels track really existed off the coast of Australia, I’d gladly brave its supposedly “non-lethal” wildlife. Witness my elation in the video below, in which I carefully adjusted my microphone levels and then proceeded to blow that mother out with giggly excitement. You’ll note I do not participate in any races or events. Those are the “and more” in the “everything I wanted and more” from earlier. All I’ve been doing—all I want to do—since the expansion launched yesterday is leap and loop and explore all the colorful plastic overlaid upon this normally semi-realistic world. The Hot Wheels Island commute must be a real blast. But yes, there are new races and events, as well as ten new vehicles including some iconic Hot Wheels models. And should I get around to creating my own Hot Wheels events, I can customize them by swapping out pieces of stunt track as if they were children’s toys. Back at Toy Fair in February I was talking to the guy in the Mattel area showing off the Rocket League Hot Wheels tie-in. I said, “You know what would be awesome? An entire Forza Horizon expansion that was just Hot Wheels cars and tracks.” He just smiled. Turns out I was right. It is awesome.